Now here is a fantastic idea and such a simple one too. 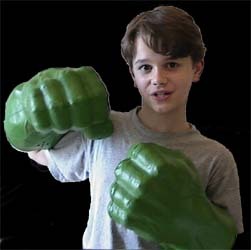 Hulk Hands are two oversized foam rubber hands which are hollowed out in the middle. This allows you to place your hands inside and grip a small pole and swing your arms around as though you were the Hulk. But even better... every time you hit something with them they emit sound effects of the Hulk smashing things (sometimes you get a Hulk growl as well, or the voice of the Hulk saying: "Hulk smash"). The box comes with a huge warning about how these hands are not to be used for hitting animals, other kids or as boxing gloves. We also found that the Hulk Hands also work neatly with another Vivid Imaginations release - the Hulk Mega Muscles Dress-Up Set. Now your little angels can run around the garden smashing their hands together as their chest inflates and their clothes rip. The children we tried this with loved the Hulk Hands - in fact, we had a little bit of a problem prying them out of the hands of some of the adults who were supposed to be merely supervising. Not only are these great for the kids, but I thing you are going to see a lot of students and adults buying these to go to fancy-dress parties. Ingenious and really good fun. These are bound to be a smash with everyone.